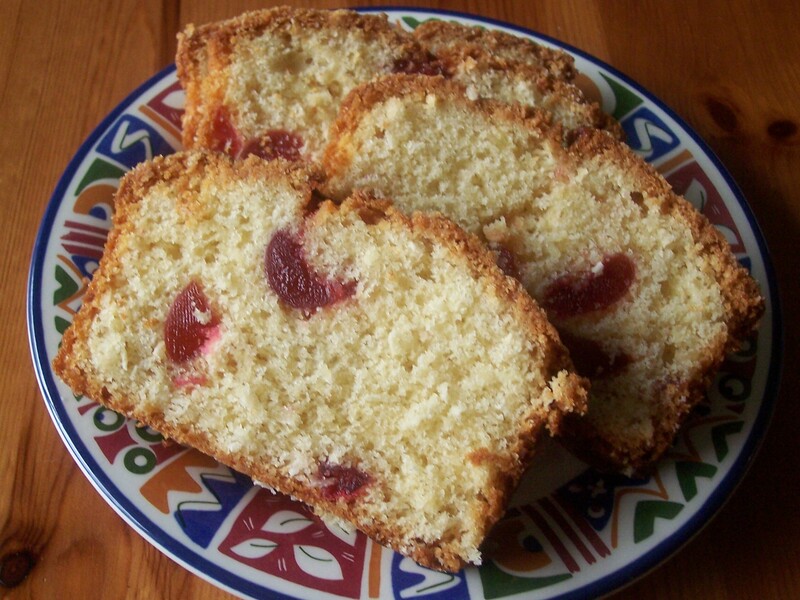 Some years ago, instead of our usual marzipan and iced cake, I experimented by making a Dundee Style one with the traditional topping of cherries and nuts. This year, having already made two marzipanned cakes with one iced as well (the Easter Simnel Cake and our Silver Wedding Anniversary Cake) I decided to make another Dundee Cake. The basic cake was made using the Special Occasion Rich Fruit Cake recipe which I use for all family celebration cakes. 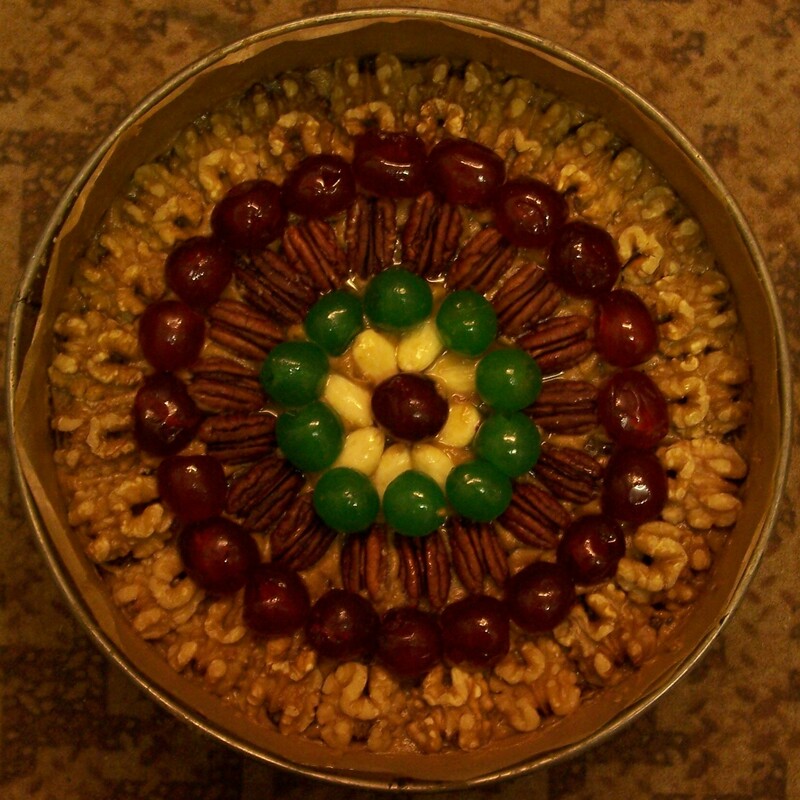 Before it was baked I selected enough nuts and fruits to put in concentric rings on top, which are added before the cake was baked. 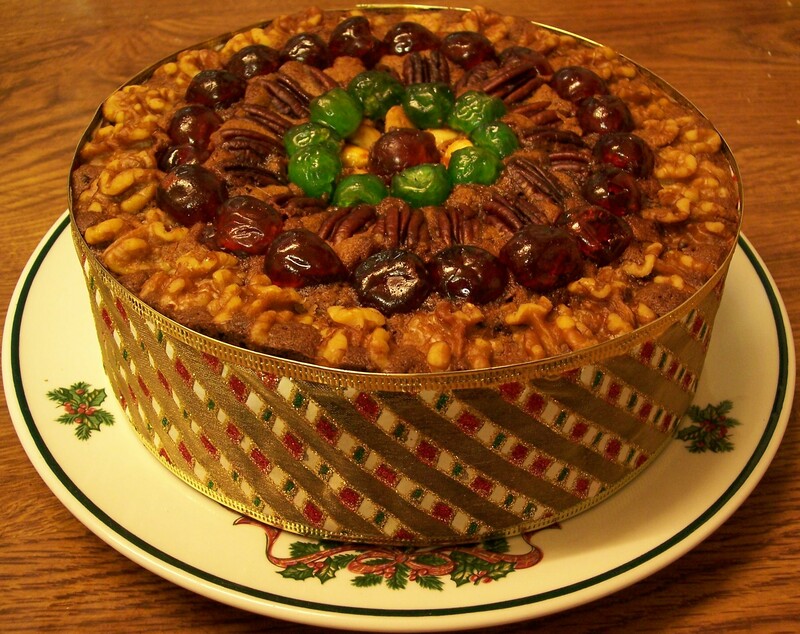 Last time I used just blanched almonds and glace cherries but this time I topped it with circles of walnuts, pecan nuts and blanched almonds interspersed with red and green glace cherries. When we were in Spain on holiday this year I discovered green cherries in little bottles and was very pleased as I have been searching for them for some years. They are not quite the same as the red cherries we have in the UK, as the syrup is much lighter, but the flavour was the same. The ribbon came from Primark and was a bargain at £1 a roll – a perfect match for the colours I had already used for the cake topping. This recipe is a regular at my table, especially in the Summer. I think it deserves a place on this site even though it seems almost too easy to be worth posting, but the simplest recipes are often the best. I don’t know how many types of tomato you are able to find locally. Most weeks just the round red type are available on our market, with unusual varieties a rarety. In the Summer there are often the small sweet ones, useful for skewering, plus vine tomatoes and sometimes the oval Italian plum type. One week last Autumn, therefore, I was surprised and pleased to see a number of varieties I had not come across before. I knew, though, that if I bought several types of tomatoes I would also need to have a plan for them. No problem: our favourite warm tomato dish, flavoured with olive oil, balsamic vinegar and basil – perfect! It would be extra pretty, multi-hued rather than the usual plain red. I decided on some medium sized pale yellow tomatoes and some enormous crinkly orange/red ones, plus the ordinary red type I had already bought at an earlier stall. Later on I saw dark tomatoes too, a combination of maroon and olive green: my heart said yes … but my head said that I had bought enough already! A pity as the splash of extra colour would have made the dish particularly attractive. Although I am sure that there are many similar versions of this Mediterranean style dish in recipe books this recipe is my own. I have not specified amounts – use as many tomatoes as you would like to serve, but be generous as this is moreish. The other ingredients should be according to taste. Since I made (and photographed) this recipe I have discovered the existence of white balsamic vinegar, though have not yet bought a bottle. It would be useful as the tomatoes would not have the usual dark staining associated with ordinary balsamic vinegar. I usually serve this as a warm side dish as part of a main meal or as a warm or cold salad. 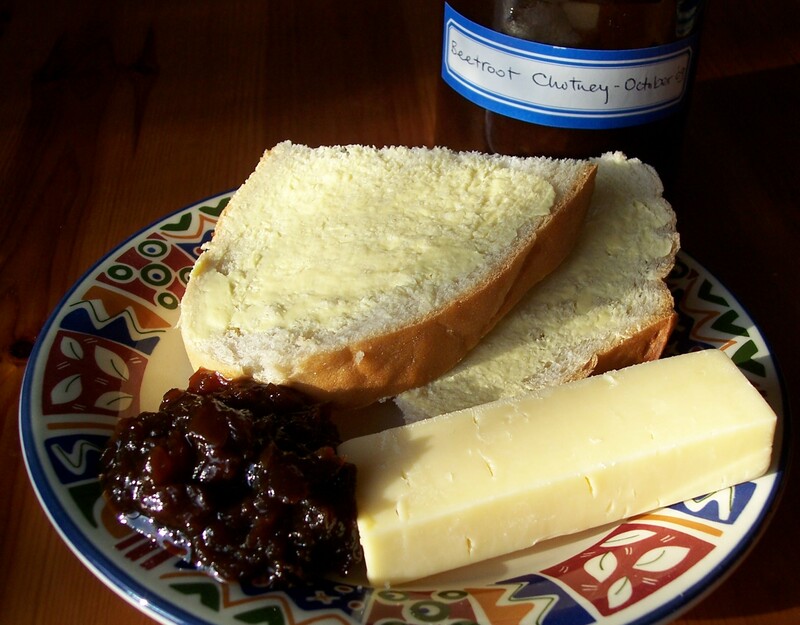 It also makes a good light lunch spooned onto a slice of crusty toast or a delicious starter, either cold or a warm, served on its own, or on crusty bread drizzled with additional olive oil, or topped with a slice of flash grilled melted goats cheese. 1. Cut the tomatoes into ¼inch/½cm slices and layer in an ovenproof dish. 2. Sprinkle generously with olive oil and balsamic vinegar. Add sugar, torn basil, sea salt and freshly ground black pepper. Cook uncovered on medium in the microwave so the tomatoes heat through relatively gently. 5. Serve drizzled with a little extra olive oil and some more torn green basil, as the original leaves will have darkened and have lost their attractive colour. 6. If adding goats cheese then, before finishing with extra olive oil and basil, lay slices of a goat’s cheese log on the top and gently flash grill to melt and colour. Alternatively toast a slice of French baguette loaf on one side, then turn over and lay a slice or two of goats cheese on the other side. Flash cook cheesy side under the grill. 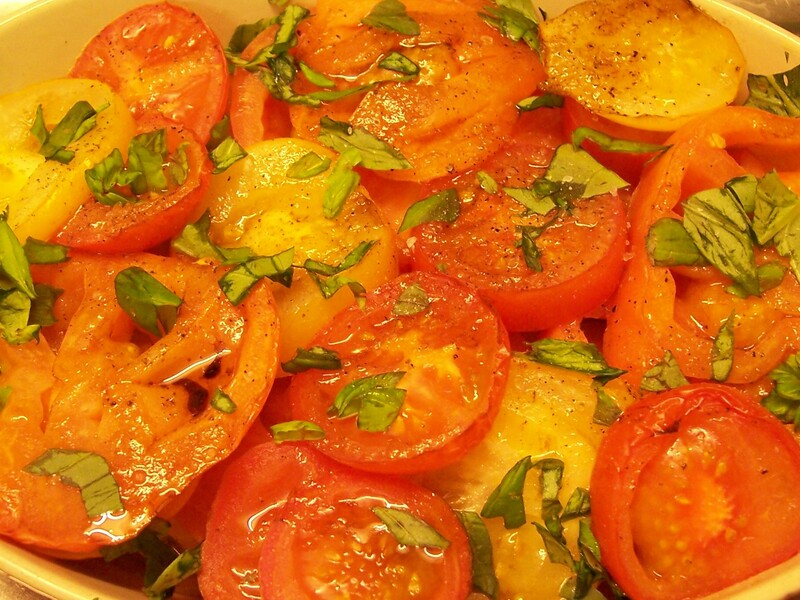 Serve laid on a bed of warm or cold cooked tomatoes. 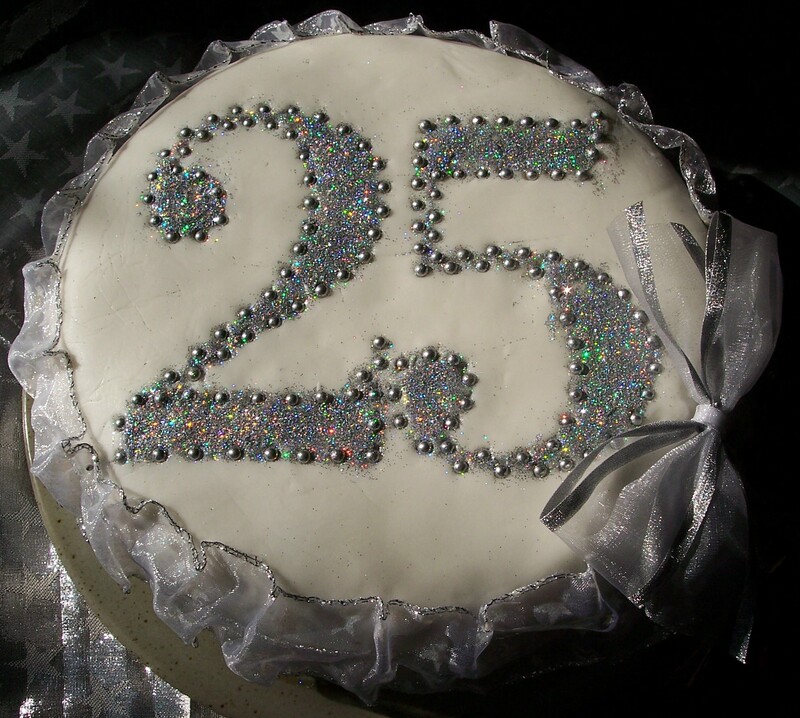 We celebrated a very special anniversary recently – 25 years of marriage – and as I have my paternal grandmother’s wonderful recipe for Special Occasion Rich Fruit Cake it seemed only right to make the cake myself. As usual the recipe was moist and delicious and it was lovely to feel that my Nanna, who died many years ago when I was a teenager was, though her recipe, able to ‘share’ in our special occasion. The cake was made and decorated in the week following our anniversary as it was made to share with the close friends and family who came to a special meal and party at home. It seemed odd, however, to add this post on any day apart from the actual anniversary. Here’s to many more and the next 25 at the very least! The recipe for the Special Occasion Rich Fruit Cake which I use at Christmas and Easter, is versatile and can be made with or without alcohol. Finish with or without traditional marzipan and icing as appropriate to the occasion for which it is to celebrate. In this case, when deciding on decoration, I puzzled for a while as I am a total novice with a piping bag (and usually fairly short on time!) In the end I decided to keep it simple, using more of the edible glitter and silver balls bought for the Starry Night Cake I made last Christmas. I googled ‘Number 25’, chose one of the many images available, enlarged it to size and printed it, after which I carefully turned it into a stencil. It was fairly easy, after slightly wetting the inside of the numbers, to thickly sprinkle on the glitter and push small balls into the outline of the numbers at regular intervals. After carefully removing the stencil, the excess glitter was brushed away with a pastry brush. The cake was finished with a ruched band of transparent wire edged ribbon with silver printing. The finishing touch was a silver bow which I have had from ages – probably rescued from a gift (I often squirrel bits and pieces away in the hope they will come in useful one day!) On reflection, perhaps a little more colour would have been good – a touch of pastel colouring to offset the greyness of the silver – however the jewel colours on the numbers glittered very prettily in the sunlight. I was not really disappointed and most importantly the cake tasted just as good as I knew, from experience, it would – thanks again Nanna! The edible glitter I used was bought from a local cake making suppliers (but is widely available). Craft glitter, which is often made from crushed glass, should never be substituted. For an unusual (non cake) idea of what to do with edible glitter look no further than here! I wonder what other culinary uses this dust fine glitter can be put to (bearing in mind that it’s far too expensive for normal craftwork). “When life gives you lemons, make lemonade”, or so the saying goes… This presumably means you should make the very best of life’s ‘sour’ situations: but definitely no metaphorical lemons here today! This should really have been a day for writing about ‘bubbly’ (rather than lemonade) as the vicar and I are celebrating 25 years of marriage, but the fizzy stuff is being saved for the celebrations with friends and family in a week or so. As for lemons, our market has been full of them recently and I absolutely love home made lemonade, with just enough sugar to take away the excessive sourness … and topped up with sparkling rather than still water we can still have fizz – life is sweet! 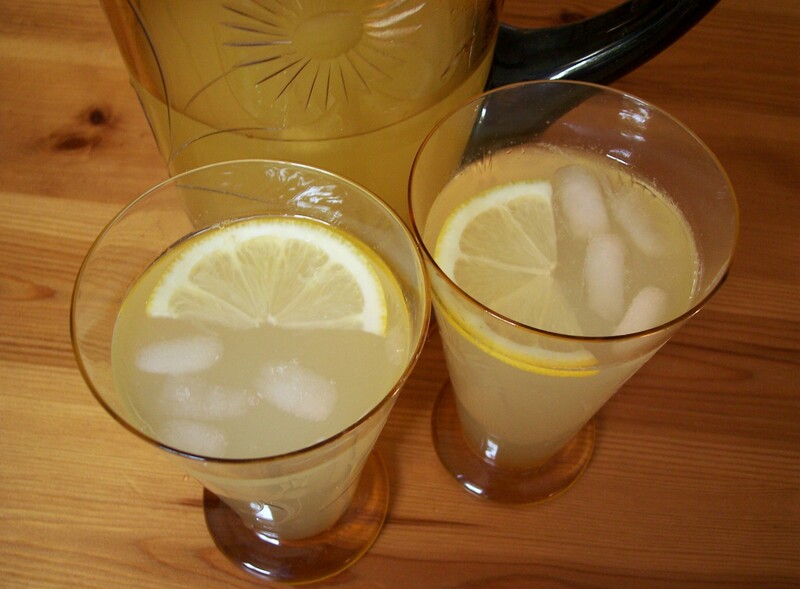 Lemonade is easy to make and definitely a good recipe for the novice cook: it was one of the first I was taught at Domestic Science in school (DS – definitely before the days of Food Technology). With the advent of the microwave oven the method has become simpler and I have given both methods below. Herb, spice or other fruit flavours can be incorporated into the the basic lemon (or orange, or lime, or mixed citrus fruit) syrup. For a long hot summer, whatever that might be (! ), or as a time saver, prepare a larger quantity and keep a ready supply of undiluted blocks of sugared zesty lemon in freeze. Dissolve, as required, in the correct quantity of water. Simply strain once defrosted before serving. It will cool the water as it melts – simple! 1 litre/1¾pints water – still or sparkling. 2. Put the lemons in a microwave for about 20 seconds on full power. This burst of heat releases a little extra juice. I understand a similar effect can be had by apply light pressure with the hand and rolling the lemon backwards and forwards on the work surface, although I have not tried it. 3. Zest the lemons into a microwaveproof bowl, avoiding the white pith which will make the drink bitter. (Use a saucepan for the stovetop method). 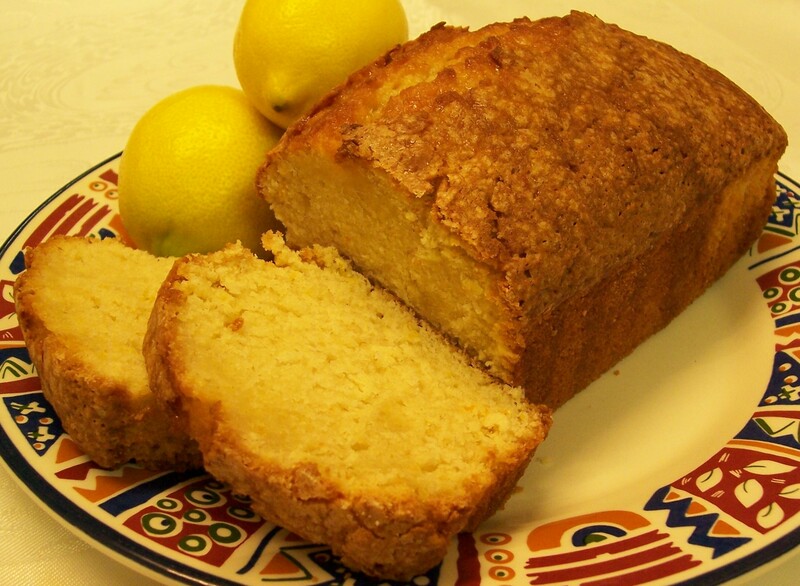 Add the squeezed lemon juice and the sugar. 4. Heat in the microwave, stirring from time to time … alternatively, heat on the stove top, stirring. Remove from the microwave or heat once the sugar has dissolved. Taste and add more sugar if needed. This takes around two minutes. 5. Leave to cool and to allow the zest to fully infuse. 6. Strain and dilute with still or sparkling water. Serve over ice decorated with slices of fresh lemon. 7. If this recipe is doubled – or more – the portions should be frozen preferably unstrained and definitely undiluted. One of my favourite orders from the Chinese takeaway used to be one portion each of Special Fried Rice and Chinese mushrooms – haven’t had it for ages, by the way, not sure why. Special Fried Rice is, as far as I am concerned, as near to comfort food as you can get in Chinese cuisine. I was delighted to find this recipe in a book of recipes from around the world I found remaindered in bookshop and it was probably the first Chinese style recipe I every tried to make. It was certainly in the days before I owned a wok. It is a great way to use up leftover rice and worth making a little extra so you can make this recipe the next day. It is good to serve as a light lunch as well as part of a multi dish meal. This was very well received as part of my mum’s Chinese style birthday dinner. The recipe was mostly based on one in Cooking and Eating Around the World by Alison Burt and I also looked at the Fried Rice recipe in Ken Hom’s Chinese Cookery. 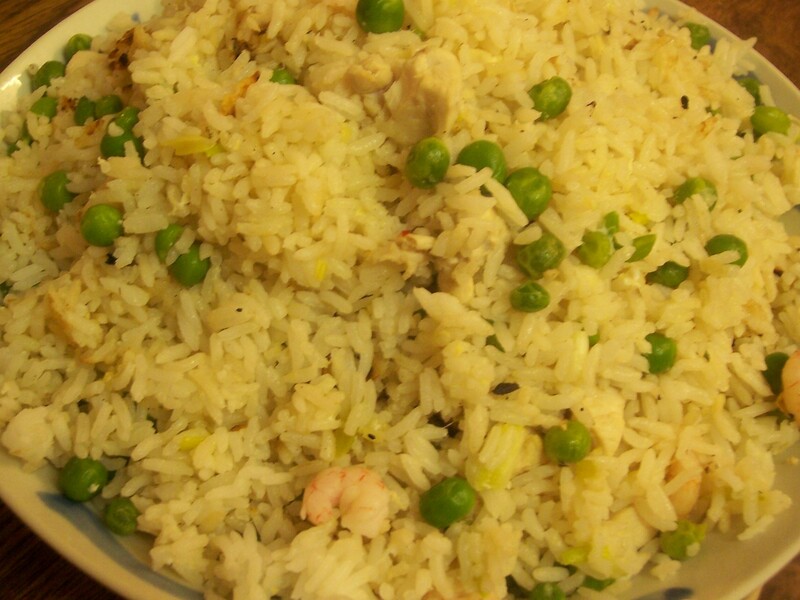 It is a versatile recipe where a selection of ingredients are fried with the pre-cooked rice. If available Chinese Sausage “Lap Cheong (sometimes spelled Xuong)” can be added. This is available from Oriental supermarkets. (See also this interesting Fried Rice post using the same Chinese Sausage: Fried Rice with Chinese Sausage, Mixed Frozen Vegetables & Eggs from Wandering Chopsticks.) Finally an egg is quickly stirred through the rice mixture and allowed to cook briefly before serving. A vegetarian version can be cooked, leaving out the meat and fish and if necessary increasing the quantities of vegetables and possibly adding another egg. This recipe mostly does not have any quantities as it uses a mixture of leftovers and ingredients chosen by the cook. Rice, oil to fry and an egg to bind are essential, plus at least one vegetable and one other ingredient – the more ingredients you add, the more ‘special’ it is. 1. Fry together the chopped onion/spring onion, ginger, garlic and button mushrooms until soft. If you are adding any uncooked meat (ie bacon) then add it at this point so it cooks thoroughly. 2. Stir in the pre-cooked rice and mix thoroughly. 3. Add part cooked frozen peas, ham, cubed chicken, prawns (and/or other ingredients of choice) plus soy sauce. Stir well to combine and cook over a medium heat for five minutes. Watch to make sure the ingredients do not burn. Season as required with salt and black pepper. 4. Just before serving add the egg and stir throughly until just cooked. Be very careful that the egg does not burn. 5. 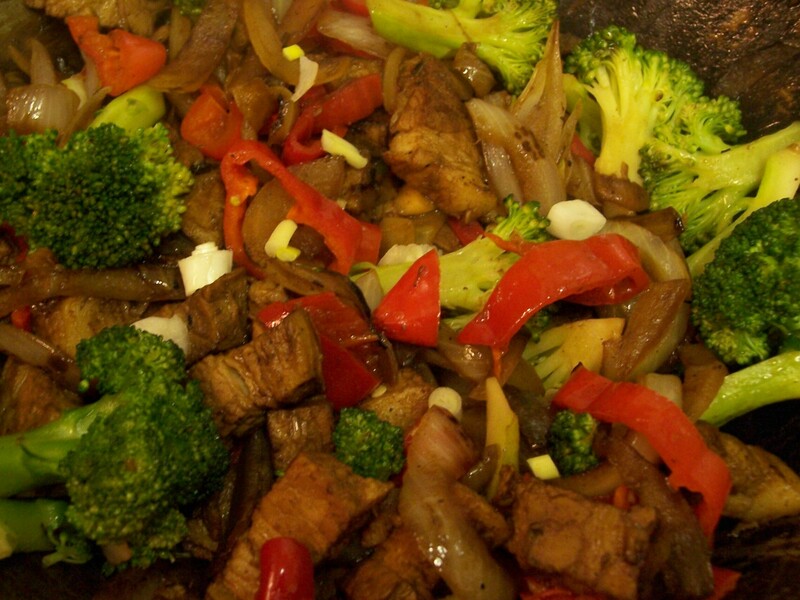 Finish with a splash of sesame oil, stir through the rice mixtuure and serve immediately. This recipe was part of the Chinese style multi dish meal I served for my mother’s birthday though it is also something we now often eat as a midweek supper. A few weeks ago I posted the method for making Poached Chicken Breasts and this recipe uses a similar method of pre-cooking the Belly Pork strips to tenderise them, as they can sometimes be rather chewy if not cooked for very long. I am sure that it would be perfectly acceptable to pre-cook belly strips by this method for other non Chinese style recipes. I like to consider that this is a pretty genuine Chinese recipe as my brother in law’s family is Chinese. It came via my sister in law from my brother in law, who learned it from his father. This was the family’s favourite recipe so my sister in law makes it very regularly, serving it with rice into which pieces of the Chinese Sausage “Lap Cheong (sometimes spelled Xuong) Wu Xiang” (available from the Oriental supermarket) have been added. 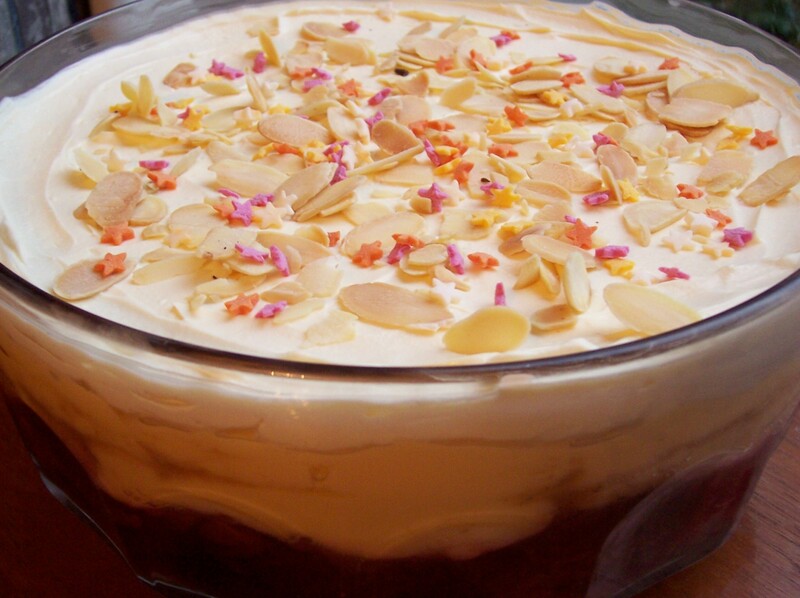 One day she served it to us and I begged the recipe – here it is. I was given very specific instructions on how to make the original version (no onion at all and I had to use spring greens) and for mum’s Chinese birthday meal I made it that way but we found the flavour of the greens rather too strong. My brother in law much prefers the original recipe without any onions. He says he likes this way as it is more savoury and not as sweet. He also has a memory of his dad crushing the garlic cloves with a knife to just break them, but leaving them intact. They were then cooked to flavour the hot oil but removed before cooking the rest of the dish: he remembers the smell of the garlic being cooked in this way. He understands that the Chinese cook garlic in this way as it adds flavour but doesn’t burn. In the end I have settled on my own variations for home cooking, which does include onion, the flavour of which we really love in Chinese food and replacing the greens with either Broccoli or Bok Choy (or choi, also known as pak choy or choi). This last was definitely our favourite version and is a very good way to use the Boy Choy which occasionally appears on our local street market. I also added mushroom slices and some colourful peppers for colour and flavour with a drizzle of sesame oil just prior to serving. This will be my regular way of cooking the recipe from now on – I just need to track down a source of the chinese sausage in small quantities. So far I have only found it in multi packs which would last me several years. A word about the oil too… My sister in law uses a special wok oil, a blend of sunflower, sesame and ginger oils with natural extracts of garlic. I just use ordinary sunflower oil and finish the dish, as advised by Ken Hom, by stirring through a slug of sesame oil – but I never use olive oil. The ‘orthodox’ original recipe: pork poached in ginger then fried in garlic infused oil with a little more ginger, the soy sauce and Spring greens added towards the end of cooking time. Below is my own variation. 1. Put the belly pork strips into a saucepan with a large piece of ginger cut into chunks. 3. Take the pork out and leave to cool. 4. Cut the pork into large pieces leave on all the fat – each piece should be should be about the width of your thumb. Put to one side. 6. Crush the garlic with the flat side of a large knife so they are flattened but don’t fall apart. Cook in the hot oil to infuse the flavour and then remove them before they burn. Crush or chop the garlic and cook along with the onion, ginger and mushroom without removing. 7. Add a chopped thumb sized ginger piece to the hot oil, along with the finely sliced onion and mushroom and garlic (if using). Allow them to soften without burning. 8. Add the sliced pieces of belly pork and cook, initially on a high heat. Add dark soy sauce to coat the meat: it is suggested the soy is used liberally but I feel this depends on personal taste. 9. Add the sliced pepper(s) if using. 10. Cover the wok and turn down the heat. 11. 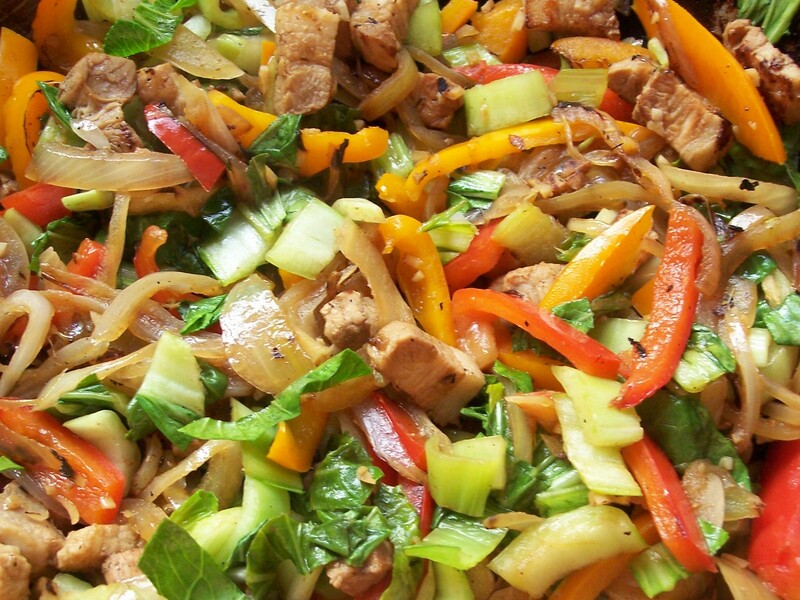 Add the chopped up greens to the wok containing the pork and ginger. Add a little boiling water if required and more soy sauce if desired. 12. Stir the greens when you adding them so they are well mixed with the pork and the sauce. 13. Cook until the meat is soft and the greens are tender. 20minutes is recommended but I prefer a shorter time so the greens still retain their crispness. 14. Just prior to serving, stir through the sesame oil. It is used to add flavour rather than to fry. 15. Serve with rice (plus Chinese sausage (see notes and below). Slice one Lap Cheong/Xuong Chinese sausage and add it on top of the rice once the rice steamer clicks over to warm, (or when almost all the water has disappeared if cooking conventionally in a saucepan). Leave for 20 mins to heat through (this is about the time the greens are added to the pork, although I like my greens cooked for a shorter time). I was reminded today that this coming weekend it is just eight weeks until we go on holiday. We are off to France again, but will also spend time in Spain, hence this month’s Spanish style theme. Apart from a few days in Barcelona as a special birthday gift some years ago, I have only made day trips across the border into Spain from France. One vivid memory I have from my first day trip into Spain on a family holiday in the 1970’s were the huge piles of melons by the roadside. In particular I remember the golden Rugby ball shaped Honeydews and enormous green and cream striped Watermelons. I also remember that we ate melon every day for most of the rest of the holiday! When watermelons start to appear on our local market it really feels as if summer has arrived, so as a foretaste of our travels it seemed appropriate to start with this simply made drink. One of my favourite ways of enjoying watermelon is as a drink, usually the thick mostly seed free but unstrained version for breakfast or as an everyday liquid dessert. Strained it can be served as an alcohol free drink on a hot afternoon in the garden or at a dinner party. I cannot remember where I got the idea of adding the mint, with which I am usually generous, but it makes a really refreshing addition. The finished drink is an attractive rosy pink colour, flecked with green. I was not surprised to find other recipes for melon based drinks including one in the July/August 2010 edition the free Tesco instore magazine. The recipe below is my own method but I have added the helpful information from the Tesco magazine as well. A melon will last for several days in the fridge once it is cut: I usually juice either a half or a whole melon at one go, depending on size and number of drinkers. In a lidded jug container it will keep in the fridge for 2-3 days although the flavour does begin to deteriorate after the first day. I have seen suggestions for drinks using other types of melon too: honeydew, Charentais or Cantaloupe with either strawberries or with ginger ale also sound delicious. (A slice of melon topped with chopped preserved ginger and a little ginger syrup is an easy and popular dessert in our house.) See recipe for further serving information. 2. As they collect, pour the juices from the plate into the liquidiser. Using a spoon scoop out spoonfuls of melon (alternatively cut the half into wedges and remove chunks with a knife). Place separately in a bowl, discarding the large black seeds. There may be small whitish seeds as well but as they are softer they usually disappear when liquidised. These can be discarded as well if wished. 3. Thoroughly liquidise the melon in several batches, including a little mint with each. Pour the thick liquid into a large jug or fridge storage container. 4. 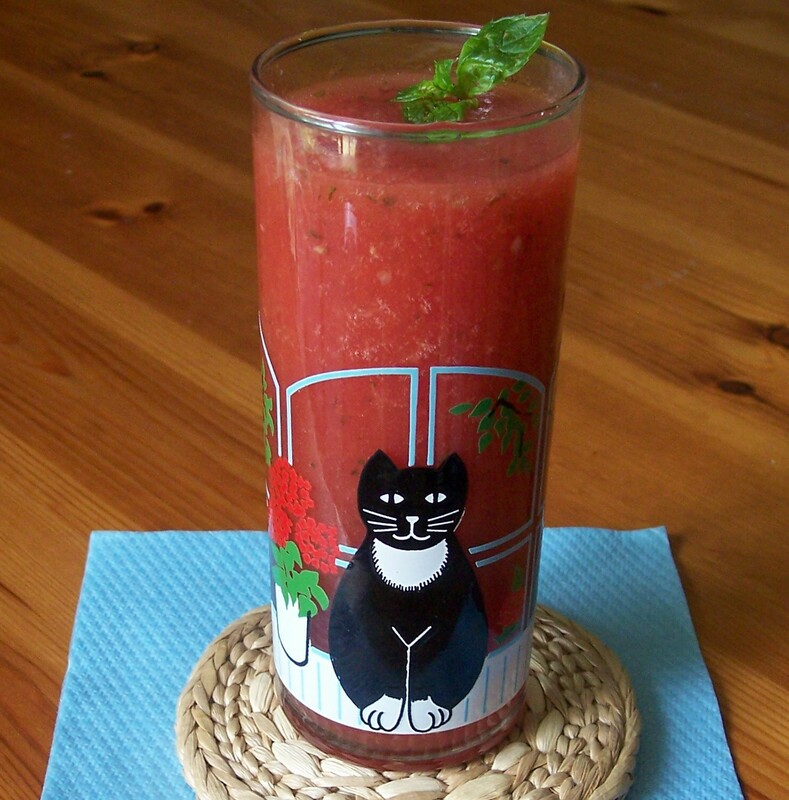 Taste the melonade and adjust the mint flavour by returning a cupful of liquid to the liquidiser with extra mint. Thoroughly mix into the whole batch of melonade to make sure the mint is evenly distributed. The melon is usually sweet so no additional sweetener should be necessary. 6. Serve chilled in tall glasses or poured over ice. Garnish with a small sprig of mint. 7. Alternatively serve Minted Melonade as a mixer. I researched a little further and I discovered several recipes where melon juice (with or without the mint) is served with gin. Tesco has a recipe for Watermelon Cooler, a version of the drink served with ginger ale, a squeeze of lemon or lime and an optional measure of gin. The July/August 2010 issue of the free instore Tesco magazine has a recipe for Melonade with mint where the basic juice is topped up with the sparkling Italian white wine Prosecco, one of my favourite sparkling tipples with a squeeze of lime juice to give ‘extra tang’. 8. The juice can also be simply diluted with ginger ale, lemonade, or sparkling water but take care not to dilute too much as the delicate flavour could quickly be lost. A Simnel cake can be made with brandy or rum, as in the basic recipe above, or alternatively pre-soak the fruit in the juice of half a fresh orange. 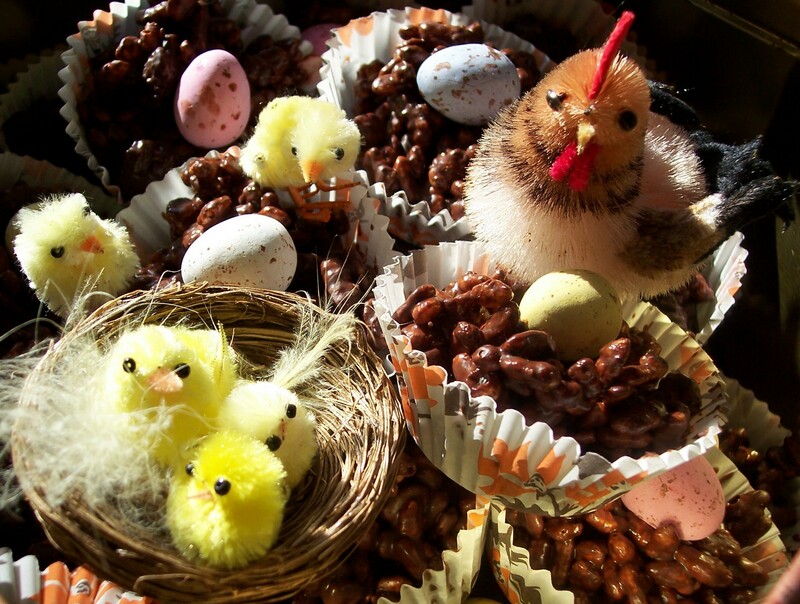 Simnel Cakes were originally made for their mothers by working children as a gift for Mothering Sunday, the third Sunday in Lent, which falls three weeks before Easter. 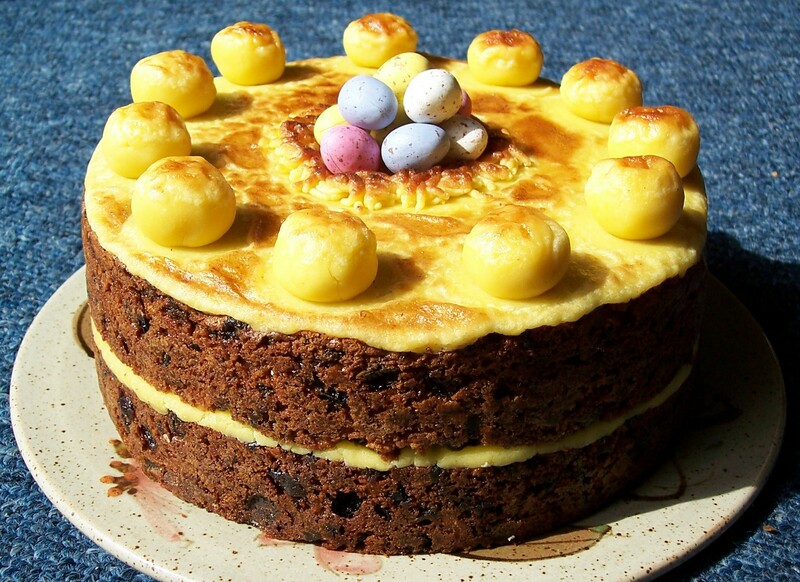 Nowadays Simnel Cakes are mostly eaten at Easter. See Afternoon Tea for Mothering Sunday for more information. 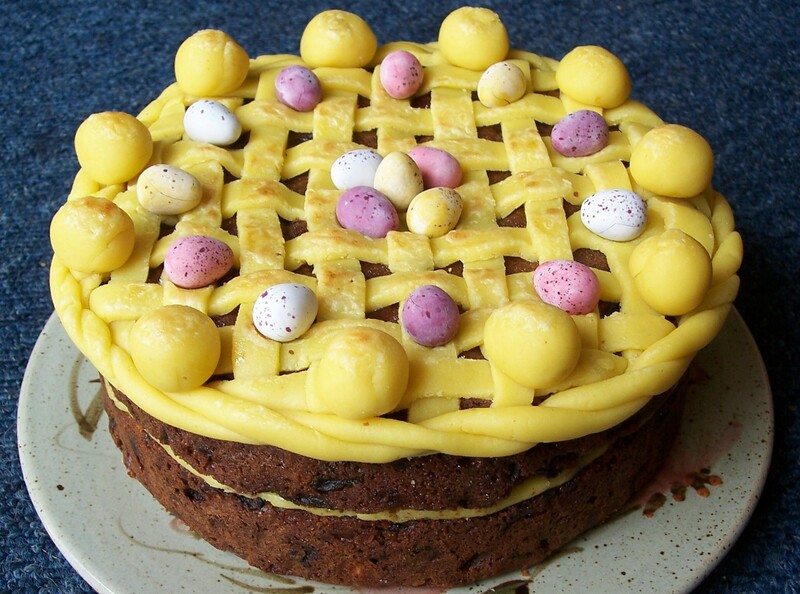 A Simnel Cake traditionally has 11 marzipan balls around the edge – one for each Disciple or Apostle of Jesus, except for Judas Iscariot!